Alpine Adventure Camp offers great deals and discounts on Chopta Trekking. Don't miss our best value deals on Chopta Trekking. Chopta a part of kedarnath wildlife sanctuary (975sq. Km approx) lies in Rudraprayag district in deep middle Himalayan zone. It’s beautiful, dense and diverse forest region is stretched from 2000 mtr. Because of its high biodiversity and beautiful landscape views chopta is being popular destination among nature lovers and popularly being called as”Mini Switzerland”.When we proceed towards world’s highest Shiva temple, the Tungnath temple at an altitude of 3680 m the presence of undulating meadows and spectacular viewsof the majestic Himalayan peaks leads Chopta camping. All along the camping route, one can get to visit the wonderful visions of Banderpooch Peak, Kedar and Chaukhamba Peaks, the essential part of Himalayan ranges. From Tungnath, the trekkers can delight themselves by trekking 1 km ahead of the summit of Chandrashila Peak at about 4000 m. The 180 degrees view of the snow capped peaks and the underlying valleys all around make this trek well worth it.Camping in Chopta is the best mode to experience of Chopta Trekking the most beautiful and picturesque spots in the whole Garhwal where the breathtaking view of the Himalayas is a natural treat for the eyes as well as the soul.A link road passes through the dense forest region to connect through the valleys of Mandakini and Alaknanda making an easy access to the upper Himalaya regions. Chopta Trekking can be the greatest fun while camping at Garhwal Himalayas sincethe region is surrounded by captivating Deoriatal Lake.. It’s a 12 km trek and by road (car) it brings 18 kms drive with an addition of 2 and half kms of trek from Chopta. 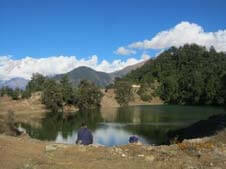 The mighty Chaukhamba Peak & Neelkanth peaks are reflected in the pristine waters of the Deorital Lake. Further one can experience the Chandrashiela Trek in the Garhwal Himalayas which is one of the most popular treks around the area and can be enjoyed the most during heavy snowing months of December & January.Chandrasila summit is a rock face above the temple of Tungnath which is the highest of all the temples in the Himalayas. It is a short but rigorous hike beyond the temple. The Chandrasila summit affords the most beautiful view of the Nanda Devi, Trishul, Kedar Peak and Chaukhamba peaks.Spending few days or nights in the Jungle camp rejuvenates one’s mind, body and soul. The Garhwal camping tour at these profound areas lets you meet the nature much closely to encounter its pure and pristine form where the trekkers and the campers can find solicitation and pacification at these areas and spend some lucrative and creative times at their grand edges.Enjoy Chopta Trekking in the Garhwal Himalayas for the best natural explorations and trekking fun at its extreme at your suitable and preferable months for the maximum thrill and serenity. In the morning you can see snow clapped Himalayan ranges. After breakfast start your trek to Deoriatal through dense forest of Rhodendron and lots of wild flowers and ferns. The trek will take 3- 4 hrs to reach Deoriatal. Overnight stay at Back to Alpine Base camp Duggalbitta. After an early breakfast trek to Tungnath, Chandrashila. Tungnath is situated at the height of 3680 mts. Upon arrival at Tungnath Temple and visit the temple. After relax one furth er 1 kms trek to Chandrasila peak. Later trek back to Alpine Camp( Duggalbitta) for dinner and overnight stay.